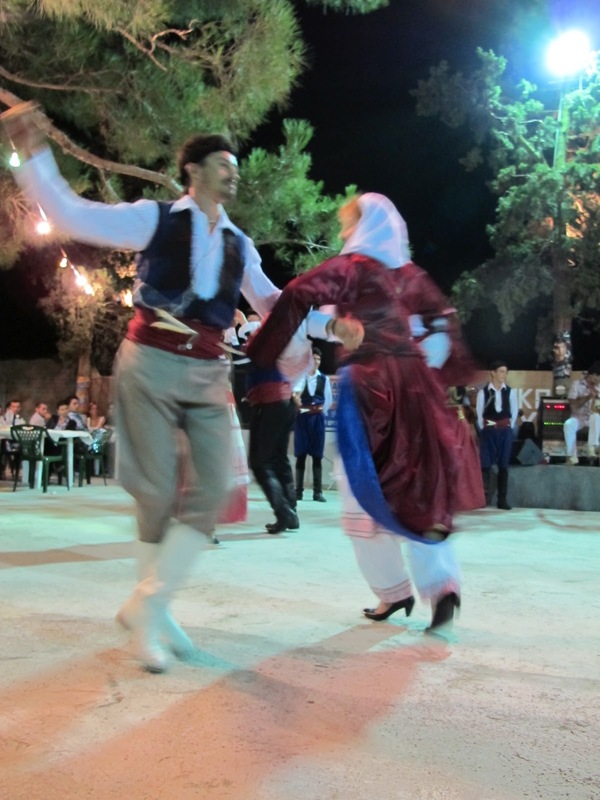 What's Really Going On In Greece: Sikia Village Party! The weekend I am sure, is supposed to be the part of the week where to take time to chill out and relax, laze around doing not very much, have a drink or two and see some friends … yeah right. Our weekend was hectic to the nth degree it started with a village party on Friday and ended up with a lot of drinking on Sunday … scratch that there was drinking the whole way though… my muscles ache and I feel so full that I may explode. Dynamite – a much loved friend from our days in the desert decided to come and spend ten days with us on the island. So far we have completed four and I am shattered. The boys have gone on a road trip down the island … stopping of in places where they are descend to cause varying degrees of trouble, we will leave it at that for now… photographic evidence will be produced and I have visions of the film ‘the hangover’ being remade in Greece! There are so many parts to this weekend that I will have to separate it into bite size chucks, for fear of not making sense and sounding like a crazed baboon! Sikia is a village in the middle of the Island; from the church you can see both the north and south coasts. It is a very pretty little village and has a beautiful village square with a coupled of tavernas and a café neo. The event its self was held at the old school. The whole village gets involved and like Sklavi they bring their friends. Rows and rows of tables are erected and seating is provided for at least 400 people. Our table was front and center, some one had written a friends name down the center of the table. We all sat down and as if by magic wine and raki appeared not long after that some one turned on the music. A short time after that the local Createn-dancing troop started with the entertainment. They were very impressive, footwork that I could not even comprehend made the dancers look as if though they where floating. I tried very hard to take some decent pictures of them dancing, but with the massive flood lights in the back ground and people constantly walking past it wasn’t that easy and I very quickly came to the realization that perhaps video would be better … when i have worked out how to put them online i will let you know. The villagers organize all the food and in there wisdom had decided to do a giant B.B.Q. This was a major task, when cooking for 400 or more people it can take quite some time. Or dinner clearly took the long road to get to us so I decided to head over the BBQ area to see what was happening … I was greeted by small mountains of meat that where waiting to take there turn on one of the two huge BBQs. Our food finally arrived at midnight, I was starving and devoured mine at a rate of knots. After the dancers came the lottery… it seems that my luck had changed and the card which I opened had a number, this entertained me greatly and one of my friends daughters when off to bring back the prize, wait for it … you are never going to guess what I won … a pair of shoes!! Really who puts shoes as prizes in a lottery?! The funniest part about them was the fact that they where high heels, everyone who knows me knows that I don’t where high heals (I cant walk in them and always fall over!) so they all burst out laughing when the high heels arrived at the table. Fortunately the heels found a very good and loving home with a friends mum. At some point it was decided that everyone should get up and dance … if you can imagine over 100 people dancing in a circle / spiral then you are doing well, there where so many of them that no matter where I stood I couldn’t get them all in one shot. As always it started slow and ended up moving so fast that it was hard to keep up with them, children, grannies, grandpas, mums, dad, brothers, sisters and the rest where all up there giving everything that they had. Dynamite and my husband tucked into the raki and promptly became hilariously intoxicated, my husband more so that Dynamite. The ride home and the impromptu ice cream feast was, as with all things, when you have intoxicated people around, hilarious… all was of coarse forgotten in the morning! Village Name day ... Party!